No description for this group yet. Monday, September 9, 2013, 7 p.m. The Oakville Camera Club encourages all members to attend our Annual General Meeting. Bylaw and election of your Board of Directors. A social evening with complementary pizza and beverages will follow the AGM. Following is a list of nominees to your 2013-14 Board of Directors. members in good standing. Contact OCC Secretary Bill Dimmick (wsdimmick@yahoo.com). President Jason Hashimoto welcomed all members and guests to the meeting. Kieley Hickey described the Capture Oakville 2012 competition and urged members to enter. Gary van Eijk announced OCC was developing a workshop on photo editing software. Jason thanked the volunteers who helped make all the events and outings successful. Treasurer Julia Lio presented the 2011-12 Financial Statement and 2012-13 Budget.. Statement and 2012-13 Budget be approved as presented. Moved by Jared Fein, seconded by Jim Shaver that the slate of candidates be adopted. Jared declared all candidates elected by acclamation. Jason thanked Jared, and chaired the remainder of meeting. Moved by Les Kapuscinski, seconded by Richard Braeken that the meeting adjourn. Oakville Camera Club Proposed Bylaw (please read). (Directors and Officers) agree to sign a copy of the Code as a condition of serving on the Board. Copies of the signed documents are to be kept by the OCC Secretary. each of its Directors, Officers, and Members. of the Club or any Director, Officer, Member, supplier or other business partner of OCC. It is not possible to provide a set of rules that would respond to every situation that may arise. disclosed in writing to the OCC Board of Directors. Board for approval before acting on them. cooperate in the achievement of the Club’s goals and objectives. negatively on themselves, or on the credentials of our Club. verbally, or in writing any evidence of improper practice of which they are aware. may face disciplinary measures and the possibility of their membership being revoked. with all laws, statues, regulations, by-laws, rules or specific direction and policies of the OCC. British Car Day is hosted annually by the Toronto Triumph Club, on the third Sunday of September. Since its inaugural event in 1984, it has grown in leaps and bounds, and now draws over 1,000 British cars and 8,000 spectators. The event is the largest, one-day, all-British car event in North America, with visitors from throughout the northeast United States, the Maritime provinces, Quebec, and Manitoba. We have even had visitors from Alberta, Texas, the UK, and New Zealand. The spectator gates open at 10:00am and Participant's Choice judging begins in earnest. Last year, there were well over 1,000 vehicles, in 52 classes of cars, commercial vehicles, and motorcycles, running the whole range from Mini to Rolls-Royce, from Austin to Zephyr and everything in between. Many people bring their daily drivers, or projects-in-progress, just to line up with the many concours-class cars in their class. This is the opportunity everyone looks forward to, to chat, to scrutinize, and plan for next year. It's a car show and it's also a big end of season social event, and a great opportunity for some classic car photography! outings@oakvillecameraclub.com - RSVP to Bernie Cook - "Please put 'British Car Day' in the subject line of your email"
Mono Cliffs contains a significant section of the Niagara Escarpment, including crevice caves, an upland limestone plain, and talus slopes. The park features two prominent masses of rock, separated by erosion from the main rock body. When this occurs, the resultant feature is called an outlier. Here you will encounter two large 'outliers' separated from the main escarpment edge. Botanists have also noted that the local vegetation includes a particularly rich diversity of ferns. Many of the natural features in the park are fragile. This park is part of the Niagara Escarpment Parks System, and the Niagara Escarpment Biosphere Reserve. The park offers excellent trail system for hiking. The park has a number of cliff faces along the Niagara Escarpment itself. Along the Cliff Top Trail is a sturdy set of stairs which descend about 30m down the rock face to a wooden path that runs between the cliff face and a small outlier, providing excellent views of the rock, ferns, and cedars. Also along the Cliff Top Trail is a viewing platform that extends out over the cliff edge, with a great view to the north east across the park to the farms and valleys beyond. In the north west corner of the park you can find McCarston's Lake. With fall weather upon us, we suggest a layered approach to your clothing, as it may be cooler in the morning, and warming up as the day goes on. Wear comfortable and supportive footwear, i.e. hiking shoes/boots are highly recommended as we plan to venture onto the many trails of Mono Cliffs. Water, snacks/lunch, camera, lenses (wide angle and telephoto/zoom lenses), memory cards, lens filters (recommend a polarizer, neutral density, gradual neutral density, etc. for shooting landscapes), and a monopod or tripod is recommended. Sturdy camera bag / backpack for carrying your gear. Bear in mind this is a hike, covering three-(3) or more kilometers, so it pays to plan your gear choices accordingly. Since this Outing is geared more to a casual walk in the woods, it is not considered difficult. The trails in Mono Cliffs are well maintained, and they are not difficult, however, various stretches of the Bruce Trail cover undulating terrain. While not considered steep, some elevation gains should be expected. The trails in general offers some good vantage points, both escarpment and lakeside vista being available for photographing landscapes. Location: Fourteen-(14) km northeast of Orangeville, four-(4) km east of Mono Centre. Take QEW to 403/410, merge onto 410 North until it becomes Highway 10. Continue North on Highway 10 and continue North of Orangeville. Turn right on Mono Centre Road (Dufferin County Rd.#8) and follow it east for eight-(8) kilometers until you get to Mono Centre. Continue North on 2 Line East until the road ends. Park on the side of the road outside the park entrance. Plan for a total travel time from Oakville of just over one hour. The objective of this course is to provide a basic understanding of the skills required to improve your photography and start to build your understanding of photography as an art form. This course will explore the common types of photography and the concepts of light, image structure and the digital image as a medium. For inspiration and direction, students will be introduced to historic and contemporary photographers influential in the art of photography and photo journalism. Through a series of instructional classes and field activities, students will be assigned challenges and encouraged to execute photography as an Art form with a goal to try different types of photography in class and outdoor “Labs” and focus on achieving individual creativity, problem solving and technical camera and photographic proficiency. understand basic camera functions of Most Digital Cameras currently on the market. understand the function of basic workflow. identify the most influential photographers and photographs that have inspired the best photography in Fine Art, media, advertising and photojournalism in the past century. edit with basic photo editing software. - Build and Add to their Photographic Portfolio. Students will discover the criteria of Photo Judging and explore how to meet the expectations of a great Photograph. Although this is a course described as “for Beginner and Intermediate Photographers”, this course is designed to teach Photography as a lesson in seeing and communicating. This course assumes students know Basic Camera Operation. This course will introduce students to the use of the camera as an instrument of communication. From photojournalism to fine art, learning photography is learning to see, observe and interpret the world around us to others. Albions Falls - Oct 20th 2013 (NOTE NEW TIME!) 8.45 at QE Park meetup, 9.30 at the Falls. To reach Albion Falls by car, exit on Dartnell Road from the Lincoln Alexander Parkway. Go south on Dartnell, then go left onto Stonechurch Road East. Turn left onto Pritchard Road, then left again onto Mud Street. You will find two parking lots available on either side of Mud Street where it connects with Mountain Brow Boulevard. 1. This Photographic Exhibition is open to members of the Oakville Camera Club. 4. Entrants may submit up to 5 images total. 5. Images entered can be taken anywhere in the world. 6. Entries will be received at club meetings beginning Monday, September 9, 2013 and must be received no later than Monday, October 21, 2013 as set out below. 7. All entries must be the work of the entrant with image(s) taken between October 2012 and October 2013. 8. Entry fee for each image is $10. 9. Images (excluding the white border) must be no greater than 12 inches x 16 inches. Minimum image dimensions are 4 inches x 4 inches. 10. No visible information or logos may appear on the front of the image other than those in the image itself. · Model release forms for photos that include people.
. Print identification directly on the back of your print. Do not stick labels on the back. Use a medium-point black marker. If using a ballpoint pen be sure to do so gently. Pressing hard will show through on the front. Practice on a discarded print if needed before identifying your entry. To indicate your printʼs orientation, include an identifying arrow to indicate up. 12. Submitted images that are not chosen for the exhibition will be returned to the photographers at the club meeting following the show. · the sale of framed and exhibited prints by OCC to promote the works of the entrants. 14. Curators will choose the collection. Not all entries will be framed for exhibition. The members of OCC will be the judges. One image will be chosen by Vote on the night of the gallery showing. Majority votes win, members decision will be final. 15. Selected images will be displayed on November 29, 2013, from 7 p.m. to 9 p.m., at QEP on Bridge Rd. The exhibition will be for sale and will hang for 8 weeks. Please remember to bring your image(s) along with your payment and completed Entry Form, as well as supporting waivers (as required). excitement as they learn to walk, seniors are shocked at the power of new technology. emotion of black and white. Show us your changing world. To read the Rules and Details follow the this link. One last outing for the year as a group? Meet at the Nelson Ave parking lot on Lakeshore Rd. by Discovery Landing. Dress warmly, bring a tripod and your best night and street photography gear and technique. Upon completion of Art Fundamentals at Sheridan College, Mark Zelinski entered the Ontario College of Art in 1975 to study design, drawing, sculpture and watercolour painting. His interests turned to photography, and he graduated as the top student of the college in 1979, winning the Governor General's Medal and three scholarships for his work. His short 16mm film entitled "Movement In White", was purchased by both CBC and TVOntario. During the next two years, he would establish his strength as a professional location photographer. By 1980, he was shooting for many advertising agencies and A/V production houses in Toronto. His early work can be seen in animated photography sequences in the National Film Board of Canada feature documentary, "Aurora...On Target.," and in a prize-winning film he shot for the Toronto General Hospital. In addition to shooting promotional stills for television commercials and stations (CHCH, CITY), he has designed and photographed several CD covers for the Solitudes music label, including the last two releases by Canadian pianist Hagood Hardy. Zelinski has photographed corporate annual reports for SunLife Assurance Company of Canada, the Ford Motor Company of Canada, Dofasco, The Canadian Red Cross, National Life and Petro Canada including shots of the Hibernia offshore drilling platform. Mark has worked with top Canadian designers, and directly with international firms such as Panasonic, Deloitte Touche and Oerlikon Aerospace. His work for numerous Canadian, American and European tour operators has taken him on location from St. Lucia to Antarctica. He has shot promotional sports photography for the Toronto Blue Jays, the Molson Tennis Challenge and the Special Olympics. For three summers, he was the official photographer of the PGA Tour in Canada. Mark has worked as a photographer and as an A/V producer for the Ministries of Correctional Services, Natural Resources, and Tourism & Recreation. From 1982 - 1988 he was the official photographer of visiting heads of state for the Ministry of Intergovernmental Affairs and The Premier of Ontario's Office. Margaret Thatcher (U.K.), Francois Mitterand (France), The Aga Kahn, and Bishop Desmond Tutu (S.Africa) are among his photographed subjects. Other government clients include Tourism Canada and the Ministry of Industry, Trade & Technology. In 1988, he shot the World Economic Summit. In 1987 Zelinski initiated a worldwide promotion of the Outward Bound organization. He photographed Outward Bound schools around the globe to produce a book of photography commemorating the first 50 years of Outward Bound. The book, entitled "Outward Bound: The Inward Odyssey", was officially launched in Wales in 1991 by HRH Prince Philip of England, who also wrote the book's forward. In 1999 Zelinski created a new company, From The Heart Publishing, and created the book, "Greater Hamilton: From The Heart". The Honourable Lincoln M. Alexander officially launched the book and wrote the introduction. Mark has also continued to photograph Outward Bound Schools to create the new book"Outward Bound: The Inward Odyssey Volume 2", which includes a foreword by HRH Prince Andrew. This new book follows the evolution and expansion of Outward Bound into the year 2002. In 2004, Mark created the hockey book, “Dog Day In Hamilton: A Day In The Life Of The Hamilton Bulldogs”, for the farm team for the Montreal Canadiens. 2010 saw the publishing of four new books by Zelinski’s From The Heart Publishing. “One Small Flame: Kurt Hahn’s Vision of Education” is Mark's fifth book, the third in a series about experiential education. His Majesty King Constantine of Greece and Canada’s own Justin Trudeau both contributed forewords for the book. For thirty-five years Zelinski traveled to more than 70 countries to create the images for “UNTITLED” and “From The Field”, his brilliant sixth and seventh books. In 2010 he also published “The Art of Industry: 50 years of photography” by photographic veteran Tom Bochsler. As a result of his art training, colour, composition, and light are Mark's forte. He enjoys serving a diverse clientele in his fourth decade as a professional photographer. Sherman Falls Location: Hamilton (43.239N 79.974W) just off of Old Dundas Road, a few minutes from Tiffany Falls. Meet at the QEP Parking lot at 9.30am Sunday 12th January for car pooling. Suggested ghear: Tripod, wide angle lens, good winter boots. There is a limited number of spots available. The only way to guarantee a spot is to submit a payment. At the OCC Portrait Workshop you will have an incredible opportunity to learn to photograph 6 models using portable and studio lighting setups. Under the eye of experienced photographers you will achieve photos worthy of your portfolio. Click here to pay and attend. Carpool from QEP parking lot - leaving at 9.30am. Entrance fee (paid at the venue individually) is $6.00 CAD because of the 105th anniversary mentioned above! Entrance fee (paid at the venue) is $13.00 CAD. From 9am to 10am we will have full opportunity to photograph at the venue with tripods and flash. After 10am, you can stay but no tripods allowed. If you would like to have more exclusive use of the venue, we can book an additional hour from 8am - 9am, but we need at least 10 people and the cost would be an extra $5.00 a person ($18.00 total for those attending from 8am). You will have an opportunity to commit to the 8am time by signing up AND PAYING for it at the February 24th Regular meeting of the OCC. Entrance fee is $12 person per session, with two sessions booked from 9.30am through 11.30am. Each group can have a maximum of 15 persons, and to enjoy the $12/person price, we must have 15 people per group. Your sign-up and payment commitments are required at the March 24th OCC Regular meeting. This is a Saturday excursion! 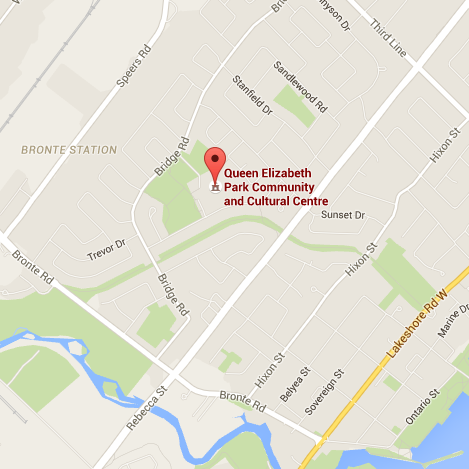 The venue for British Car Day© is Bronte Creek Provincial Park, conveniently located at the Burloak Drive exit off the Queen Elizabeth Way. The south entrance is for non-British cars & spectators, while the north entrance is reserved for British car exhibitors and vendors. Show cars gain access to the park via the north maintenance/service entrance, at the bend where Burloak Drive becomes Upper Middle Road, from 8:00am onwards. The spectator gates open at 9:00am and Participant's Choice judging begins in earnest. The judging wraps up at 1:00pm and the awards ceremony begins around 2:00pm. Entry fee to the park for spectators is $16 per car (or use your Parks Ontario season pass). There is no limit on the number of people in the car. Please pay using cash if possible. Car pool to split costs. This year, the OCC Fall Colours outing will be on Sunday October 5th 2014 at the Terra Cotta Conservation Area. Entry fee is $5.00 (pay at the entrance booth). This ticket will also get you into Belfountain Conservation Area only 10 minutes away if you would like to venture to that location also. The trip is approximately 45 minutes heading north-east on Winston Churchill. There is fine landscape photography on offer with bodies of water to enhance the view. There should be some good opportunity for macro photography along the trails also. Pack you landscape (wide angle, grad filters etc.) and macro gear. Don't forget a tripod. The Terra Cotta Lane trail is roughly 4km and ranked as beginner - well groomed trail with almost no elevation changes. Dress for what seems to be a cool Fall season and where comfortable shoes. Hiking boots are not necessary. Car-pooling can be arranged via communication through this forum or email - let me know if you are interested and it will be arranged. The usual starting point will be the QEP Parking lot.